Patrons of city public transit systems can use this transportation complaint letter to request changes to trains or bus schedules. As a taxpaying citizen of Anytown, I am extremely displeased with the level of service offered by our public buses. I understand that transportation infrastructure is complex, but the system by which our city organizes the buses needs to be changed drastically. I frequently use public transportation to get around Anytown as well as during my daily commute to and from work. We have several bus lines that are intended to provide convenient access to locations around town. This would be effective if the buses ran on a dependable schedule. In the past week, I have experienced six late buses on my commute and one that did not arrive at all. One way to improve this situation would be to add additional service. Another might be to streamline the way people get on and off the buses, as this slows down the system. In the very least, the bus schedule needs to be modified to more accurately reflect when the buses arrive. I hope that you will take my complaint into consideration. 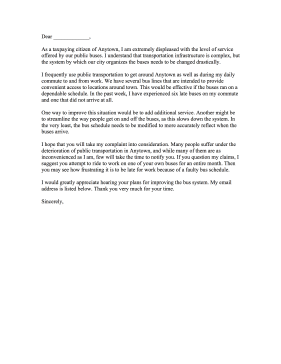 Many people suffer under the deterioration of public transportation in Anytown, and while many of them are as inconvenienced as I am, few will take the time to notify you. If you question my claims, I suggest you attempt to ride to work on one of your own buses for an entire month. Then you may see how frustrating it is to be late for work because of a faulty bus schedule. I would greatly appreciate hearing your plans for improving the bus system. My email address is listed below. Thank you very much for your time.